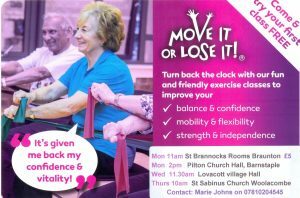 I am very pleased to be a part of the Move it or Lose it transform ageing initiative and to be setting up classes in the South West. We work with the FABS Training Programme which has been designed by experts to help bring together the four key components for healthy ageing – Flexibility, Aerobic, Balance and Strength exercises – in one fun-filled class. All exercises can be done seated or standing depending on your ability.